A full record of the scene and its contents should be recorded so that these details are available when physical evidence is examined in the forensic laboratory, and when a case is prepared for the courts. These details help to "reconstruct" the events for those who are investigating the case and for the court, which will need to have factual evidence presented to it at trial. The full record can include a sketch of the scene as well as photographs and video. A sketch is often prefered because it can leave out clutter (which is often present in photographs) and should always include measurements. Nomatter what form of visual evidence is collected, the CSI must always take accurate notes in the form of a scene of crime report, also known as a CID6 report. These notes will record a description of the scene itself, and details of the modus operandi (the mode of operation - such as how the person gained access to the scene) of the perpetrator of the crime. The CID6 form will also contain details of every item recovered by the CSI such as when and where it was recovered, and a unique identification number. These details will help the CSI at some later date (which may be more than a year after the crime scene was examined) if and when they are tasked with writing a statement when required to attend court to give evidence. The CSI will begin keeping a record of their actions at a scene of crime as soon as they begin their assessment of it. A photographic record of the scene will ideally include images of the scene from various locations, such as from the four corners of a room looking towards the middle of the room. Of course, it is not often possible to do this until after the scene has been examined syatematically, but the CSI will capture these and other wide-ranging views. Further photographic records will then be made of smaller parts of the scene, capturing the relative positions of items of evidence that will later be collected. Finally, close-up images of individual items of evidence will be recorded, in many cases with and without a scale rule. A tripod to help stabilise and "frame" the shot is always used, and off-camera flash is very frequently required too. The photography of items will often occur at the time they are collected. 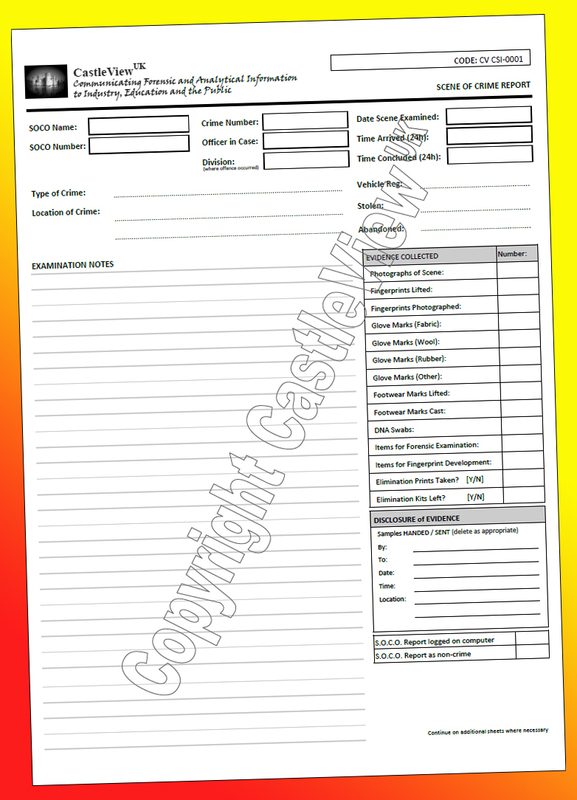 The CID6 (or crime scene report) form is used by CSIs (in the UK) to record details of their actions at each and every crime scene they visit. It is vitally important that CSIs accurately record details about the scene and every item they recover from it.